Ascolta l'intervista a Robert Irwin e James Turrell, due maestri di Land Art, e scopri di più su di loro visitando "AISTHESIS - All'origine delle sensazioni", la mostra d'arte contemporanea a Villa e Collezione Panza, Varese. Inside a gleaming San Diego tract home, 89-year-old artist Robert Irwin reclines in his favorite leather lounge chair, snug in his favorite worn baseball cap, sipping a fizzy Coke over ice. Irwin has lived here about 15 years “because my wife wanted kids on the block for our daughter,” he says of his now 23-year-old. Still, the cozy setting seems incongruous. With dark sunglasses donned and legs outstretched, Irwin appears less the renowned contemporary artist that Los Angeles County Museum of Art Director Michael Govan calls one of the most innovative artists of the ’60s and ’70s and more a relaxed suburbanite, tanned and ruggedly handsome. But Irwin’s minimalist, site-specific installations toy with the viewer’s sense of perception, and if you look more closely here, his home reveals Irwin-esque touches everywhere — beauty in the benign. Sunlight seeps in through glass panes, apropos for a California Light and Space artist; nearly every window has views of his wife’s garden, nodding to Irwin’s love of artful plantings, like his Central Garden at the Getty Center; the elongated entrance hallway features a stark wall cutout offering a peek of the sky. And the chair? It’s a Charles and Ray original that Irwin bought in the ’60s from the Eameses themselves, back when his studio was in Venice near theirs. Three years ago, Irwin found beauty in a gallery, Sprüth Magers, then under construction on Wilshire Boulevard. Senior director Sarah Watson was a friend who had shown Irwin’s work at the now defunct L&M Arts in 2011 — the last time Irwin exhibited large-scale work in Los Angeles. He stopped by to view the new space and was smitten with the soaring windows and the sunlight bouncing off the concrete floors, not to mention the surrounding streetscape. He was appalled, though, at the interior walls that were going up to display artists’ work. His affection for the gallery and its surrounding outdoor environment resulted in a new, immersive installation that debuted there Jan. 23. The work — six 10-foot-square white-scrim chambers featuring spray-painted squares and surrounded by tinted window squares or lacquered square wall paintings — takes over the entire ground floor of Sprüth Magers. The gallery cleared all but one interior wall on that level to make room for the piece and changed operating hours because the installation is meant to be viewed only in daylight, its angles and shadows shifting with the sun. The effect is ethereal and elegant, if deceptively simplistic at first, a geometric maze of gauzy-looking cubes housing receding images of squares that are translucent head on but jet black from the side. Passersby cast fleeting, ghostly silhouettes that seem to float around the piece. But, like a freshly snapped Polaroid slowly pulling into focus, over time, geometric strategy and artistic rigor emerge. Pillars and squares delineate precise horizontal and vertical axes. A square on the north wall aligns with a square window on the façade of LACMA, across the street. It draws the viewer’s eye outside, extending the work to include life on the sidewalk. Glimpses, through the scrim, of the lacquered squares on the lone interior wall nod, teasingly, at the gallery’s obliterated walls and the paintings that once hung there. Govan, whose relationship with Irwin dates back to the mid-’90s, says the work poses more questions than answers. Four of Irwin’s light works are on view upstairs, a space divided by a transparent, black scrim wall. The works are vertical groupings of fluorescent tubes that Irwin wrapped with richly colored theatrical gels. Electrical tape on the outside of the tubes creates both delicate and thicker line work. Each piece has a distinct color palette: One is jewel-toned, another cool and sea-foamy. Through the reflections and refractions they cast, Irwin is, in a sense, “painting with light,” he says. A new survey exhibition of more than four decades of Irwin’s planning materials sheds light on his creative process. 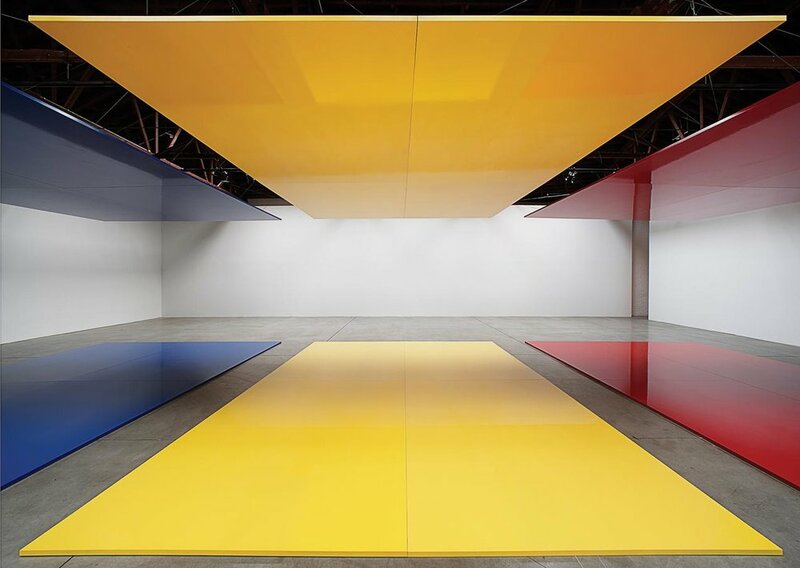 “Robert Irwin: Site Determined” opened at Cal State Long Beach’s University Art Museum on Jan. 29. The exhibition, curated by Irwin scholar and art history professor Matthew Simms, includes Irwin’s architectural drawings, models, photo grids showing ideas for plant materials and water features — “the kinds of things that get rolled up and put away once the board room conversations are over and the final project is realized,” Simms says. About a third of the exhibition is devoted to Irwin’s 2016 “Untitled (dawn to dusk),” at the Chinati Foundation in Marfa. Irwin transformed an abandoned U-shaped hospital building using black and white scrim, turning it into a vessel of sorts that responds to the shifting and changing light. The show also includes early plans for Irwin’s Central Garden at the Getty, which opened in 1997, and an unrealized project from the ’80s in which Irwin questions the role that public art could take at the Miami International Airport. An office nook in Irwin’s home is alive with such process materials for upcoming projects. Printouts of multicolored succulents and swaths of cracked earth are tacked to the wall, and rolled up architectural drawings blanket his desk. I made plans, but nobody’s taken interest in them yet. Nobody wants to let me play. Irwin says he’s developing a plant-based work for the new Academy Museum, possibly a small garden, which would be an extension of the ideas in his “Primal Palm Garden” at LACMA next door. When the Academy Museum is finished, he’ll create new plantings on LACMA’s campus to give the two works cohesion. He’s also working on a proposed a project for the Château La Coste vineyard in the South of France, a long mulled idea to carve “five black holes” in a small lake with silicon bronze. “No body’s ever done anything like that,” he says. Talking about the new work, Irwin’s eyes gleam. One eyelid hangs low from a recent surgery. He has glaucoma and has had several surgeries over the past few years. But his sight is good enough, he says; he still works regularly, attuned to the subtleties of the spaces he inhabits. And if he can open your eyes too, then he’s done his job. He savors a sip of cola, before a teasing smile appears on his face. This is work that has grown out of a tenet Irwin arrived at years ago: “What made an artist an artist is a sensibility,” he says. Without “the limitations of thinking about being a painter, you can operate anywhere in the world.” That’s why his oeuvre is so hard to characterize. Today Irwin is best known for installations made with little more than scrim and natural light. 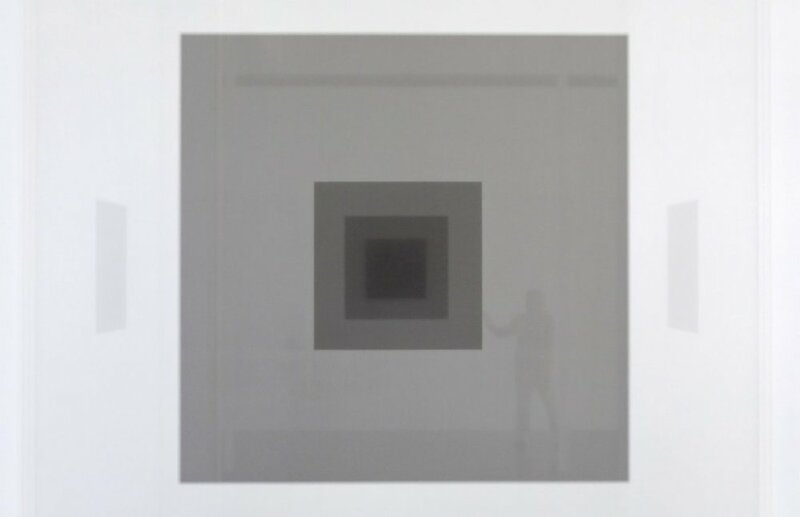 These seem nearly invisible at first but then suddenly intensify viewers’ perceptions of the surrounding space, such as a 1977 piece at New York’s Whitney Museum of American Art: Irwin’s minimal intervention, which included bisecting the fourth floor with just a line of black paint and a scrim panel, has gone down in art historical lore. He has also created a garden overflowing with hundreds of varieties of plants for the Getty Center in Los Angeles, which opened in 1997, and designed buildings, including the Dia Art Foundation’s outpost in Beacon, New York, where in 2003 he shaped everything from the sky-lit galleries to the parking lot. “Bob is a philosopher. He has led this life off on the edge, doing things that no artist would do today,” says Michael Govan, Dia’s former director, who hired Irwin for the Beacon project. Govan now helms the Los Angeles County Museum of Art, which boasts an outdoor installation of primal palm trees by Irwin as well as a 36-foot-long light sculpture, Miracle Mile (2013), which glows behind them 24 hours a day. But in the beginning, Irwin made paintings. A few of those early works, most of them abstract oils on canvas, will soon go on view in Robert Irwin: All the Rules Will Change(April 7 through September 5), at Washington, D.C.’s Hirshhorn Museum and Sculpture Garden. Comprising 29 works made between 1958 and 1971, the show covers the period Irwin refers to as “the phenomenological reduction,” when he rigorously purged his abstraction of anything that suggested narrative or content. He reduced expressionistic marks to lines, then to shimmering dots, and eventually replaced the square, painted canvas with a single spray-painted plastic or metal disc. Hung away from the wall and lit so that its edges disappear, each disc appears to float. “This is as close as I could figure how to break the frame,” he says. That, essentially, is how Irwin came to create the Getty garden, the plans for Dia: Beacon and countless other works. It also led him to the commission that will close the Hirshhorn show, an installation called Square the Circle. Using scrim, he is planning to transform one side of the museum’s round gallery space, designed by architect Gordon Bunshaft, into a square. “This piece will be like all his work: impossible to describe, impossible to photograph, but great to see,” says Melissa Chiu, the Hirshhorn’s director. Then there’s Irwin’s magnum opus, which he is planning to unveil in July at the Chinati Foundation in Marfa, Texas. (The museum, which was founded by the sculptor Donald Juddon the site of a decommissioned Army base, will celebrate its 30th anniversary this year.) The 13,000-square-foot work, which Irwin has been developing since 1999 at Chinati’s invitation, is based on the C-shaped footprint of an old hospital, with black and white scrim to shape the vistas and the light, and subtly tinted windows framing a thin strip of land and the expansive sky—what Irwin has called “a Dutch landscape–like view.” At its center stands a grand Stonehenge-like grouping of basalt columns and paloverde trees. “The opportunity for him to do this permanently is exciting, because his installations have been so ephemeral and temporary,” says Jenny Moore, Chinati’s director. For money, he bet on the horses and briefly taught art at Chouinard, UCLA and UC Irvine. His teaching philosophy was the same one he’d established for himself: “Help them develop their sensibility.” As well as “emphasizing preparation,” recalls Ed Ruscha, and “delving into the science of vision and light, he’d push you off into your direction, not into his direction. He had an instant form of communication that told you that there’s possibility out there and all you have to do is find it.” It doesn’t seem surprising that so many of his students became stars, including Chris Burden, Doug Wheeler, Vija Celmins, Larry Bell and Joe Goode—all known for wildly different sorts of work, from body art and performance to photorealism. Though Irwin’s work couldn’t be disseminated through photography or catalogs, his mythos spread through writing. In the 1970s, Lawrence “Ren” Weschler, an acquaintance who’d been meeting with him to discuss philosophy, became so taken with their conversations that he turned them into a manuscript. Excerpts of it appeared in 1982 in The New Yorker, where Weschler was a staff writer, and soon became a book, Seeing Is Forgetting the Name of the Thing One Sees, which remains so popular that over 30 years later it’s still in print. Not only has it made Irwin a guru of art students everywhere, but it also introduced general readers to his life and philosophy (“Who cares about all this virtuality when there’s all this reality,” he says in the expanded 2008 edition). Although Irwin carps quite a bit about the increasing need to revisit the past, borne in upon him by the book, his advancing years, the Hirshhorn show and other historical projects, like a catalogue raisonné that Artifex Press has undertaken, he is also clearly galvanized by the explosion of interest in his work. He is, as ever, most interested in what’s in front of him and rejects the idea of polishing his image for posterity.